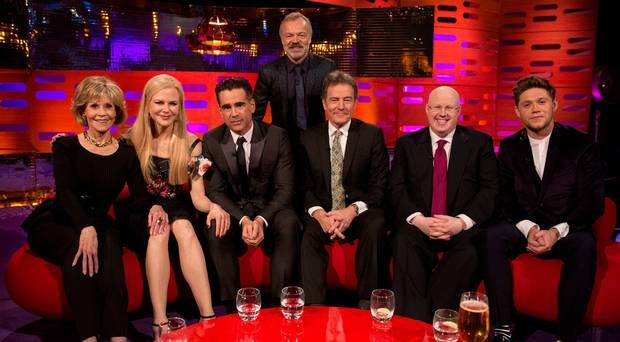 Nicole Kidman appeared on The Graham Norton Show last night and she caused quite the storm on social media. The actress came on to the chat show to talk about the Best Actress Emmy she won for her performance in Big Little Lies. However, viewers were more interested in discussing what her face looked like, concerned the actress had been using too much botox. Nicole Kidman stop with the Botox or whatever you have done. Your face isn't moving. Grow old gracefully. I like Nicole Kidman but good lord her face is like it’s made of wax. Nicole Kidman keeps trying for facial expression but the mask just won’t let her. Things didn’t get much better for the 50-year-old actress when she was joined on the sofa by fellow guest Jane Fonda. Although Jane is 29 years older than Nicole, making her 79-years-old, viewers praised the legendary actress for ageing gracefully. Jane Fonda’s on. Nicole Kidman is delighted to have another guest on with a less mobile face than hers. On the show Nicole spoke about winning the Best Actress Emmy for Big Little Lies, a television drama about a murder which happens in the tranquil beachfront town of Monterey, Calif. I really feel like Reese (Witherspoon) and I won that together. We produced it and worked our butts off to get it made so it really is our award. It was so much work getting it to the screen and then to have it embraced the way it was. It really was a fantastic journey. The actress also spoke about her new film, The Killing of a Sacred Deer, which made its UK premiere at the BFI London Film Festival earlier this week. The film tackles the themes of suspicion, paranoia and medical ethics as a surgeon is forced to make an unthinkable sacrifice after his life starts to fall apart. The director (Yorgos Lanthimos) is a very particular film maker. It’s very dark but I found it fascinating to morph into what he wanted. Colin Farrell, who stars alongside Nicole in the film, also appeared on the chat show last night. The actor spoke about working with director Lanthimos once again, having starred in his previous film The Lobster. I think Yorgos thought he had made an outright comedy. But I found it pretty dark and I was depressed by it. The Killing of a Sacred Deer will be released in UK cinemas November 3.